St. John Eudes was a Seventeenth Century Normand French cleric who extolled the virtues of a devotion to Sacred Heart started observing a feast for the heart of Mary in 1643. When Pope Leo XIII proclaimed Eudes heroic virtues in 1903, he was proclaimed "Author of the Liturgical Worship of the Sacred Heart of Jesus and Holy Heart of Mary". Pope Pius VI in 1799 granted a limited feast to "The Most Pure Heart of Mary" in Polermo. In 1805, Pope Pius VII made a new concession which spread the practice more broadly. In 1855, the office and Mass of the Most Pure Heart of Mary was approved. In 1944, Pope Pius XII instituted the Feast of the Immaculate Heart of Mary in 1944 to be celebrated on August 22. In 1969, Pope Paul VI moved the feast to the third Saturday after Pentacost, immediately after the the Solemnity of Sacred Heart of Jesus. The heart that resembles that of Christ more than any other is without a doubt the Heart of Mary, his Immaculate Mother, and for this very reason the liturgy holds them up together for our veneration. Responding to the Virgin's invitation at Fatima, let us entrust the whole world to her Immaculate Heart, which we contemplated yesterday in a special way, so that it may experience the merciful love of God and know true peace. 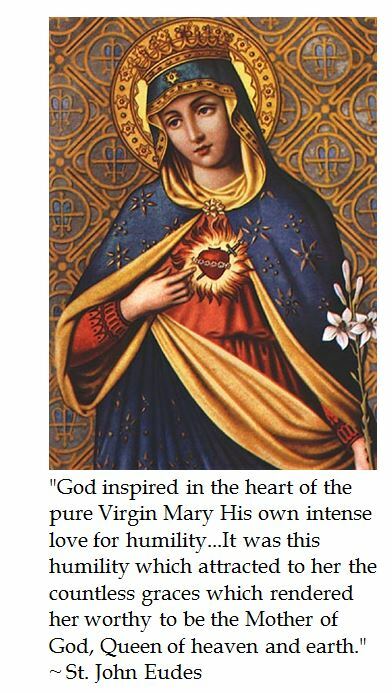 Because of the strong analogy between Jesus and Mary, the consecration to Mary's Immaculate Heart is closely linked to the consecration to Jesus' Sacred Heart, although it is subordinate and dependent on it. That is, although the act of consecration is ultimately addressed to God, it is an act that is made through Mary. The aim of the devotion to the Immaculate Heart of Mary is to unite mankind to God through Mary's heart, via consecration and reparation. One who is consecrated to Mary's Immaculate Heart as a way of being totally devoted to God. This involves a total gift of self, something possible only with reference to God but Mary is the intermediary in this process of consecration.